Purchasing a commercial dishwasher for your restaurant, cafeteria, hospital or other institution will be one of the more expensive commercial kitchen purchases you will be making. Since most restaurants will opt for a dishwasher of some type, as they are more economical than washing by hand, you will need to know the different types available on the market. Each type is suitable for different types of food establishments, so you will want to assess the unique needs of your foodservice business so you can determine which type of commercial dishwasher will best suit your needs. To determine which commercial dishwasher you should purchase you will need to know the following: type of restaurant, number of plates used per meal, number of glasses used per meal and number of pots and pans used during meal preparation. This information will help you determine the commercial dishwasher type and capacity that will work best for you. Information such as the health codes, NSF regulations and restrictions particular to your specific location, such as water usage, can also have an effect on your final decision. There are several types of commercial dishwashers available in the food industry. If you run a small restaurant, an undercounter dishwasher, similar to a residential one, may be large enough to accommodate your needs. An undercounter dishwasher can handle a maximum of 35 racks per hour and they are usually made using a built-in heating element that flash heats dishes and washware to 180 degrees Fahrenheit to thoroughly sanitize them. Undercounter dishwashers can be found in smaller commercial kitchens, nursing homes and daycare centers, and they fit snugly under most standard height counters so they won't take up valuable kitchen space. Door-Type dishwashers have a door that slides up or down allowing racks to be easily moved in and out. They are usually used in conjunction with dishtables to allow for easy pass through of dirty dishes. They can handle capacities of up to 80 racks per hour, making them a popular choice for most mid-sized restaurants. Large volume food establishments, such as a large hospital, university cafeteria, or other large dining hall, where very large amounts of dishes need to be cleaned, will need a conveyor dishwasher. A conveyor dishwasher allows you to place dirty warewashing racks at one end of the conveyor which takes the dishes through a complete warewashing process, coming out clean at the other end. Depending on the size, a conveyor dishwasher can clean up to 400 racks of dirty dishes per hour. 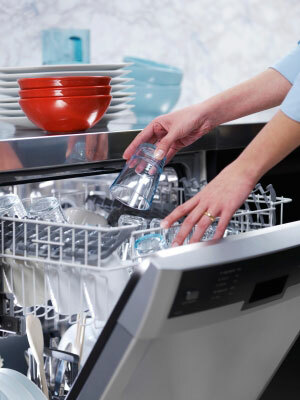 Similar to a conveyor dishwasher, a flight type dishwasher uses a conveyor to push the dishes through the warewashing process, but without the use of dish racks. They are used for large institutions, such as banquet halls, hotels, universities and hospitals and need to be custom built and designed for each commercial application. Dishes are placed directly on the conveyor and go through different washing zones that get the dishes clean and sanitized. Their capacity is often determined by the number of dishes that they can wash per hour, rather than by the number of racks. Glass washers are used primarily in bars and restaurants that use large volumes of glassware and stemware. They use low pressure water to get glasses clean and avoid breakage. Depending on the size of your bar or restaurant, you can choose a glass washer that can wash anywhere from several hundred to several thousand glasses per hour. Pot and Pan Washers use high pressure water and a longer wash cycle to remove baked-on food, grease and grime from pots, pans, baking sheets and utensils. These are usually found in large commercial bakeries and commercial kitchens where doing this strenuous type of cleaning job by hand would not be cost-efficient. Now that you understand the differences in the types of commercial dishwashers, you will need to understand the major differences in purchasing a high temperature dishwasher over a low temperature dishwasher in order to make an informed decision. High temperature dishwashers use heat to sanitize dishes and glassware. They must heat up to 180 degrees to meet NSF regulations and therefore may require an additional purchase of a booster heater to reach that desired temperature. While they do use more energy than low temperature dishwashers, they don't require the use of chemicals to sanitize dishes. They also do not cause damage to dishes, glassware and flatware as a result of chemical solvents. They also dry dishes very effectively by flash drying them at the end of the wash cycle, thereby reducing food safety risks. ,high temperature dishwashers clean dishes more effectively, although the initial costs may be greater. Low temperature dishwashers use a chemical bath to clean and sanitize dishes and glassware. This method is said to be less effective when cleaning grease laden dishware. The costs of running a low temperature unit are lower, because heating costs are reduced, but dishes may have to be frequently rewashed in order to get them clean, which in turn will increase water usage, water bills and electricity bills. Also, chemical solvents may corrode pipes, glass and stainless steel and may leave a residual taste on the washed dish and glassware. A final factor to consider in your commercial dishwasher purchase is the energy efficiency of your unit. Energy Star is a governmental agency that rates commercial dishwashers on their energy efficiency, this means their utilization of energy efficient features to save on water and electricity. Dishwashers that receive an Energy Star rating will use automatic fill and idle pump shutoff features, built in booster heating units and other features to improve energy efficiency. Purchasing a commercial dishwasher is a big investment, decide what you need, shop around and don't forget to plan for the future. A good commercial dishwasher can last anywhere from 5 -10 years, so anticipate the growth of your foodservice business to find the best size dishwasher for your present and future needs. Look into all the warranties that come with your equipment and purchase any further warranties and service plans that go along with the unit, as these usually pay for themselves after as little as one use.